This post will let you know the chances of Narendra Modi for Prime Minister of India. BJP has recently announced Mr. Narendra Modi as the Prime Minister candidate for the upcoming Loksabha (parliament) election 2014. As per the Astrologers of india, There are very storng chances for narendra modi to become the PM of India, He has Rajyog in his horoscope. There are few problems that will problematic, but he will make it to final for sure. 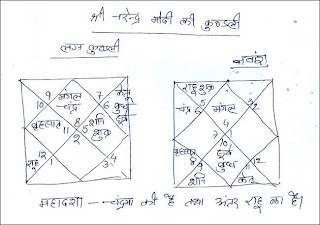 As per the astrologers of Kashi, "Modi ki kundli main Vrushik Lagna or Vrushik Rashi hai or surya ki hamadasha se gujarane ke karan unka bhagy in dino kafi prabal hai". "Vrushik Lagna main mangal langesh ho kar baithta hai or chandrama jab bhagyesh hota hai to lagna main jab bhi ye sanyog karte hai tab rajyog banta hai", he added more. As per Dr. Kameshwar upadhyay Astrologer,"Narendra modi ki kundli kafi achi hai. Jab vrushik lagna main mangal lagnesh or chandrama bhagyesh ho to rajyog banta hai, Modi ki kundli main rajyog hai". Also, Unki kundli dekh kar batate hai ki pancham sathan or bhagya sthan kundli main bahut mahatva rakhte hai. Swami Chandra main hai or jis vakt election hoga, un dino narendra modi k bhagya sathan main brahuspati hoga, jo nischit hi faldayi hoga. Many Astrologer believes that modi has "gaj kesri yog" in his horoscope,which will help him to achieve the highest point of his life. As per the astrologer Rushi,"Narendra modi ki rashi vrushik main graho ki stithi k karan unko samanya virodhiyo se savdhan rehna padega". As per the astrologer Pawan Tripathi, "Narendra modi ki kundli mian gajkesri yog hai jo unko kamyab banayega or unke netrutv ki sakti ko bhi majboot karega. 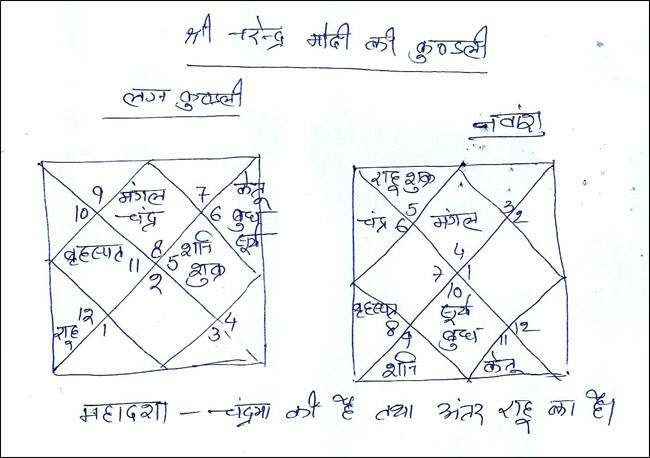 These are the some of the prediction from the indian astrologer. While the famous astrologer Bejan Daruwala already mentioned in one of the TV Show, that he has personally seen the HAND of narendra modi and he strongly believe that Narendra modi will PM for sure. 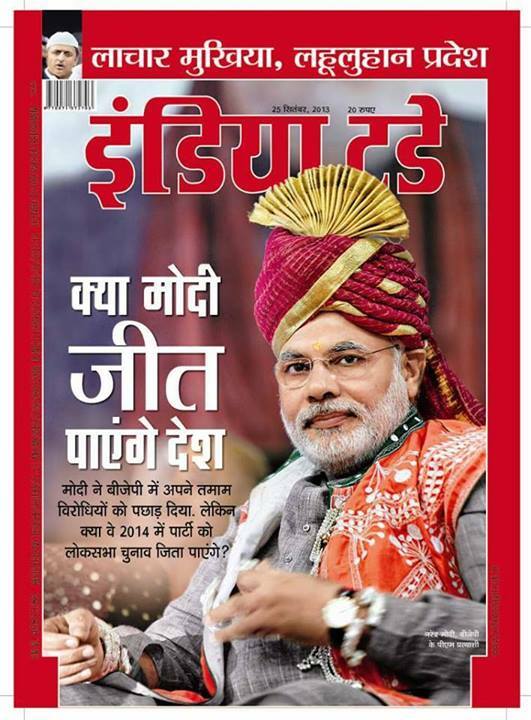 Narendra Modi, Modi Kundli, Kundli of Modi, Rajyog, Prime Minister Candidate. Most of the people believe what Sh Pawan Bhayya ji say. Has he predicted anything about Sh Narendra Modi? It is very important for all countrymen. Kindly respond to this email. I do not say all astrologers are less knoledgeable or .... But the way Bhayya ji tell the astrology it has scientifical basis, which I find less in other predictions. I may be wrong. I would request Bhayya ji se ki app ek shrankhla shuru kareyn jo astorlogy ke bare mai ABC se batai and kept on net. 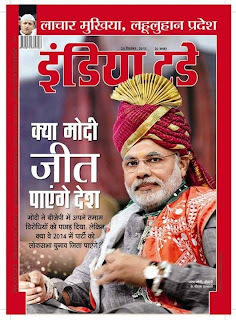 Narendra Modi Future Astrology Prediction 2014 elections.